viagra ” says Des Kennedy, endocrinologist with his wife Sandy on their Denman Island property. The Kennedy’s 11-acre property is once again featured on the Denman Home and Garden Tour, which takes place June 15 and 16. ” src=”http://www.infocusmagazine.ca/wp-content/uploads/2013/06/des-sandy-602×401.jpg” width=”602″ height=”401″ /> “This tour always reminds us that we live in paradise,” says Des Kennedy, with his wife Sandy on their Denman Island property. The Kennedy’s 11-acre property is once again featured on the Denman Home and Garden Tour, which takes place June 15 and 16. This June 15 and 16, hundreds of people will flock to Denman Island to attend the 20th Denman Island Home and Garden Tour. They’re going mainly for the Island’s renowned gardens and homes, of course, but there’s more to it than that. After all, these days there are garden tours all over. What draws people to Denman, an otherwise tranquil 95-square-kilometre chunk of forested rock with just over 1,000 inhabitants? “Not to downplay our gardens and homes—they really are the big draw—but people also come to get an intimate look at what the dream of rural Island life looks like in reality,” says Home and Garden Tour coordinator Autumn White. Since being settled by Europeans in 1874, Denman, like many Gulf Islands, has been a prime destination for people wanting to turn their backs on cities and create some kind of alternative life that is closer to nature, less defined by commerce, and, in theory, simpler. The early settlers were true homesteaders who cleared the land and laboured to create the first farms. Then, in the 1970s there was an influx of back-to-the-landers, some of them ‘political refugees’ from Vietnam-era USA. Many of these people are still on Denman. 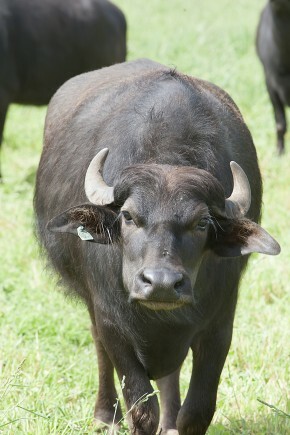 Their vision and their land projects have matured over the years, just as they have. Two different properties on the Home and Garden Tour together offer an intriguing insight into what back-to-the-land looks like as practiced by two different generations. 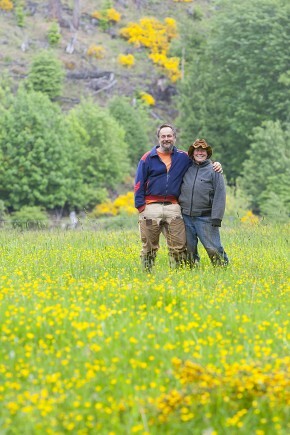 Des and Sandy Kennedy moved to Denman in 1971 from Vancouver, buying an 11-acre recently logged property, with the intent to live off the land. This is exactly what they have been doing since then, hand-building a house primarily out of salvaged materials, creating extensive food gardens and a spectacular ornamental garden, all while Des was making a name for himself across Canada as an award-winning writer, broadcaster, public speaker and national gardening personality. Tracy Horovatin and Shayne Barker bought into a Denman heritage farm as land partners in 2007, with the goal of building their own house using natural, non-toxic, locally-sourced materials—no drywall or plastic. They delved into learning about permaculture, putting their new knowledge into practice to develop the farming operation, which is intended mainly to feed themselves. Their house is a not just an exemplary green building, using no drywall or plastic throughout, but also a work of art, with gorgeous cabinetry made by Shayne (a European-trained woodworker) and Tracy’s colorful mosaics built into the natural plaster walls. 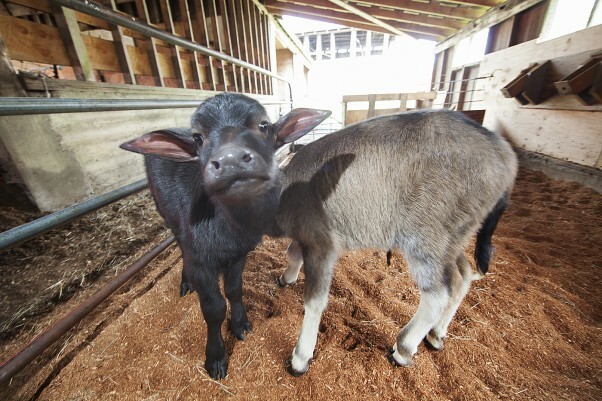 The farm area is extensive, and busy, with vegetables, fruits and a bunch of classic farmyard animals—cows, pigs, turkeys, ducks, chicken, geese and a few pets. There is plenty that these two couples have in common: a do-it-yourself spirit that applies both to feeding and housing themselves, a love of nature, an environmentalist ethic, and a strong commitment to “living better with less,” in Des Kennedy’s words. They both love Denman Island equally for its natural beauty and its vibrant, engaged and artistic community. They both contextualize their ‘alternative’ lifestyles as conscious choices that have political and social significance. But their stories are, in many ways different. Shayne and Tracy were initially motivated by a desire for permanent housing. Living in a rental on Denman didn’t meet their needs for stability and for a long-term relationship with a piece of land. But they couldn’t afford the escalating land prices of the early 2000s. Through community connections, they partnered with a farming family and set up a unique land-share arrangement that allowed them to buy in affordably and build their own home. The farming aspect came along with the deal, as a sort of surprise bonus. “I like to call us ‘accidental farmers,’” says Tracy. Des and Sandy, on the other hand, were living the urban dream in Vancouver and made a major life decision to move to Denman. “We were living in Vancouver, making decent money and doing neat political work, and really, really liking it,” says Sandy. “But we just knew, in our hearts, that we wanted to grow our own food and be close to nature.” Des had visions of sitting in a cabin in the woods, writing all day (he soon realized he hadn’t factored in the sheer amount of work involved in the back-to-the-land life). Finding, and affording, land was arguably easier back then. “The Gulf Islands weren’t discovered. There was no new highway and no monster ferry. So it was less expensive than up the Fraser Valley or the Sunshine Coast,” says Des. The 1970s back-to-the-land wave was in its infancy, and the Kennedys’ choice mystified their friends and family. “It was horrifying for them. Back then only weird people would do such a thing. Grow-your-own-food was so weird! We were seen as hippies,” says Sandy, laughing. Des continues: “We were lumped in with all those stereotypes. It was considered dropping out of society and failing to make something of yourself. “The first half-dozen years I was wracked with anxiety: ‘What are you wasting your life here for, digging out tree stumps when you could be doing something meaningful? I thought maybe I should get a law degree… I should do something. Shayne and Tracy’s experiences so far suggest that he’s right. What they’re doing reflects social and cultural trends that most North Americans, at least, understand. “The more you pay attention to the news—the meat scares, the reports on the amount of salt, sugar and chemicals in our food, and the virtues of the 100 mile diet—the more we are reminded that this is the right path to be on,” says Tracy. Their project garners lots of interest, with people lining up for WWOOFing sessions (Willing Workers on Organic Farms—a global work exchange program), Denman community members showing up for work parties, and productive partnerships forming, ranging from a “boar-sharing” project with another Denman farm to a relationship with a local permaculturist who has come on board as a co-farmer. Currently they have a young couple settling in for a residential six-month work exchange program. “My friends and family are all supportive. Actually, they’re envious,” says Shayne. Nonetheless, Shayne and Tracy do share some of the anxiety Des described: “There is always that questioning—does this make sense, how do I justify what I’m doing?” says Tracy. “But you know when I was working [as a non-profit organization administrator] I was having a lot of anxiety over my job, and then when I quit Shayne was watching me have anxiety as I headed out into the garden… So the question was, ‘Honey, do you think it’s your personality?’” she says, laughing. And aside from those early moments of self-doubt, Des and Sandy Kennedy have always felt the same way. Validation came to Des as his writing and broadcasting career took off, much of it based on his sharing of his and Sandy’s homesteading life. “Being a writer is a way of doing outreach. I get feedback from all over the country about how my books have influenced people. And I do tons of speaking engagements,” he says. The Kennedy’s home and garden will be open to the public for the Denman Home & Garden Tour. Des continues: “In terms of participating in the world— I think to some degree it’s people doing what we did that triggered an enormous revolution in terms of how people approach not just their food but their lives. We didn’t call it sustainability back then. We just felt we had to live in a way that fits with the needs of the planet. These sorts of ideas have now permeated our culture. The idea of doing better with less—well, now it’s apparent that the whole culture has to adopt this. The alternative is unthinkable. But she and Shayne are both careful to distance themselves from any sort of missionary zeal. “I don’t see myself as changing the world,” says Tracy. “All I can do is lead by example and change my immediate surroundings. Living with very little money is a key component of what Tracy calls “devolution.” She and Shayne have scaled back their spending, partly so that the need to find paid work doesn’t distract from the farming, and partly because they find stepping away from consumption has in fact enriched their lives. For instance, there’s no need to spend money on movies, restaurants, cable, etc. “We don’t need to be consumers of entertaining—rural living is actually very entertaining,” says Shayne. To cut their spending, she and Shayne ‘shop’ at the Denman FreeStore for clothes, household goods and more, and as much as possible they eat food they’ve produced themselves, even if it means going without foods they’ve been accustomed to. They gotten rid of their cell phone, they drive less, they use salvaged, recycled and free natural materials for their building projects, and more, although they have no interest in cutting out skiing or the occasional sunny vacation. The Kennedys have been following this path for years. “We live very cheaply and feel incredibly rich,” says Sandy. The Kennedys see the Home and Garden Tour as a chance to share that wealth—not just because this event is a fundraiser for local conservation, but also because they see how inspiring the experience is for the hundreds of people who explore their property. 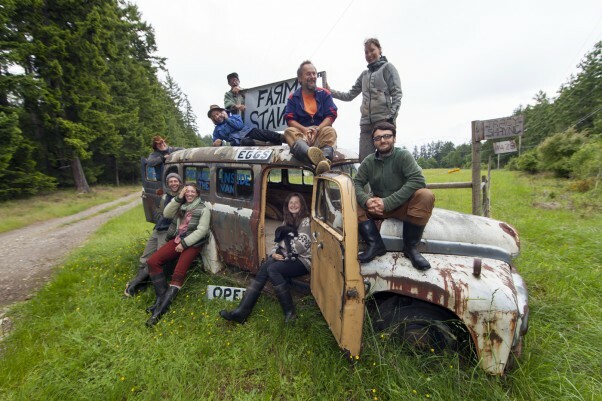 Tracy Horovatin and Shayne Barker with a group of people who work the land with them, at their “Farm Stand” location on Denman. As many as 1,500 people visit the gardens and homes of Denman Island during the annual or bi-annual tour, wanting to connect, whether they are thinking about permaculture principles or simply soaking up the beauty. “This tour always reminds us that we live in paradise,” says Des. 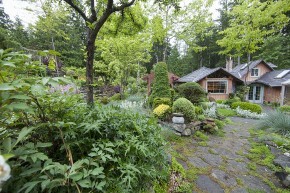 The Denman Island Home and Garden Tour takes place June 15 & 16 from 9:30am to 5 pm. There is a 9am ferry leaving Buckley Bay. Tickets $18 (kids free). If you can’t make the whole tour, but would like to visit one or two locations there will be a $5 single location entry fee. Tickets are available at www.denmanconservancy.org, Art Knapp Plantland and Home & Garden Gate in Courtenay, Blue Heron Books in Comox, Rusty Rooster in Cumberland, and Apple Seed Cottage and Something Special in Campbell River, or call 250-335-2148. All cyclists will be entered in a free draw—enter at the ticket table at the Community Hall. The StrongStart room located at Brooklyn Elementary may be the size of a normal classroom, but it is chock-a-block full of activities designed to hold a young child’s attention. Every corner, every nook and cranny, is stocked with toys, games, books and art supplies that are there for the sole purpose of helping a young mind grow and have fun. In the storytelling corner, underneath the big green leaf, are stacks of books and comfy cushions. In another corner is the aquarium where the tadpoles are just about to sprout legs. There’s the home life area, with a miniature kitchen complete with appliances, dishes, pots, pans and pretend food. The art centre with everything imaginable to create works of art has all the supplies within the child’s reach. Near the front door is a netted enclosure where the caterpillars are hanging out, waiting to emerge as butterflies. And smack dab in the middle of the room is the dramatic play area—this time it’s a kid-sized bus complete with steering wheel, seats for passengers, safety handles and pull cords. It is so colorful and fun, it makes one wish they were a young child. Maureen Wagner is the facilitator of the Brooklyn StrongStart program. Trained as an Early Childhood Educator, Wagner has worked with children and families for approximately 30 years. For the past six years, she’s facilitated the StrongStart program at Brooklyn Elementary and has turned the StrongStart room into the amazing cornucopia of fun that it is. The StrongStart BC program was initiated by the Ministry of Education seven years ago to address the growing belief that education during a child’s earliest years is critically important. In fact, one US study, the Abecedarian Project, demonstrated that young children who receive high quality early childhood education from birth to age five excel in reading and math and are more likely to graduate from high school and receive a four year university degree. The study concluded that a child’s attendance in an early childhood program is directly associated with long lasting benefits that reach well into one’s adulthood. Currently there are more than 300 StrongStart programs operating in the province, and more than 33,000 children access the program every year. Here in the Comox Valley there are four full time StrongStart centres at the Queenesh, Cumberland, Courtenay and Brooklyn Elementary schools. 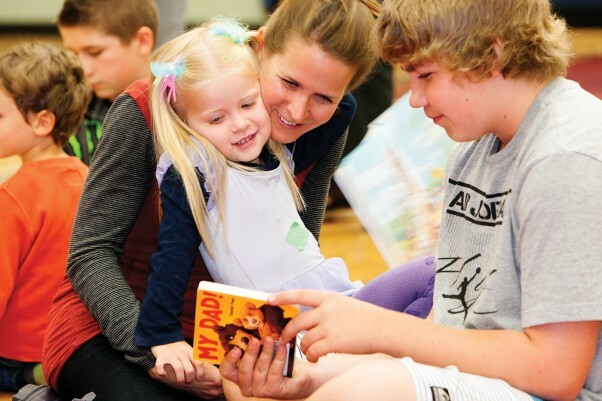 In addition there are five outreach sites that run on a reduced schedule at the Denman and Hornby elementary schools, and Aspen, Royston and Miracle Beach elementary schools. Unlike daycare or preschool, the StrongStart program is not a place where caregivers drop off their children. “Instead of a drop off program, StrongStart is a drop-in program designed for both the child and the adult,” says Wagner. In fact, parents or grandparents can drop in anytime the program is running, between the hours of 8:30 am and 12:00 pm, Monday through Friday during the school year. According to Wagner, that’s where the magic really happens. The program also helps the caregivers become comfortable in their child’s school environment. “Here at Brooklyn Elementary my focus is to set up a program where families feel welcome, comfortable and confident,” Wagner says. “I’ll often have home baked goodies for the adults, and the coffee is always on.” By encouraging the parents to become involved early on in their child’s education, the StrongStart program makes it more likely that the parents will stay engaged as their child’s education continues. Good news travels fast, and word is getting around that the StrongStart program is the place to be. “It can be really busy in here. In fact, one day we had 50 children show up. Though it was exciting, it’s not a day I’d like to repeat,” says Wagner with a laugh. On average, 30 to 35 children drop in at one time or another during the course of each day. Considering that each child has an adult with them, it’s easy to imagine how busy the Brooklyn StrongStart room must get at times. And the kids are busy too, learning that is—though they probably don’t know that. To the kids, they’re just having fun. But according to Wagner, that’s the very thing she’s hoping to achieve. “StrongStart is a play-based environment that builds on the interests of the children. It provides a variety of play options like art, dramatic play, science and more which can be intermingled depending on the children’s exploration and creativity. A play-based program allows the children to take risks, problem solve and delve further into a topic.” Wagner calls it learning through discovery. StrongStart is a multi-generational program that creates connections between people of all ages. The children themselves range in age from newborn to five, and the adults range from young parents to grandparents. The kids even interact with older kids from the school on a regular basis. This is called the buddy system and it’s based on the Roots of Empathy program that was started in Toronto. Big Buddy Day, as it’s called, occurs between the StrongStart children and the Grade 7 students every second week. To further enhance the multigenerational aspect of the program, once a month the Brooklyn StrongStart children visit the residents of Glacier View Lodge. “When the children come to visit it really affects the residents,” says Liz Friis, director of Resident Lifestyle and Community Programmer at Glacier View. “There is a twinkle in their eyes and their smiles are broad. Visitors walking up the path to the log home and studio just north of Courtenay are greeted by a set of playful green “Garden Googlers”, who guard the door with wide eyes. From their perch in a flower pot filled with sand, these funky creatures are the first hint of what a visitor will find inside the door to Fireworx Glass Studio, which is filled with things both beautiful and intriguing. Jewelry, wind chimes and wall art are just some of the items on display—an array of vibrant colors and reflections that adorn the small studio outside of owner Sabine Arends’ home. Inside the studio Arends stands at a table surrounded by sheets of glass where her workshop stations are set up and stages of fused glass are waiting to become jewelry. Arends’ newest creations—chunky glass in rainbow hues—are a work in progress and are about to be wound with ribbon for summer bracelets. This passion for glass jewelry, where each piece is a one-of-a-kind, began for Arends 10 years ago in Victoria, when she created her first mosaic bowl. Over the years she has enjoyed different mediums. From mosaics she shifted into combing concrete, glass and grout for stepping stones. Then she moved into stained glass and finally mirrors. The kiln, which brought with it new possibilities, is the base of Arends’ business in glass fusion, and Arends now has two of them at her studio. After selecting glass and cutting it into the desired shapes, the pieces are placed in the kiln and fired to fuse them together. The finished pieces are always unique. While jewelry tends to be her focus, this certainly does not limit Arends, who also creates bird houses, bowls, candle holders, and other creatures such as the whimsical Garden Googlers. “I connected on Facebook to help me find a name,” she says of the bright owlish figures. More than 50 names were suggested online, and “Garden Googlers” just seemed to fit. Arends has found Facebook to be a great avenue for her small business, where she advertises, seeks input, and connects with others. “You see how many people are really interested if you get feedback or not.” This can help her determine what direction to take. “Cats and dogs get a lot of interest,” she says with a smile, although it is hard to imagine animals in her art, as most of it is so abstract. Some pieces have images transcribed within layers of glass—a little fairy peeks out here, a tree looms up over there—but mostly you see brightly composed and subtle shimmering art. 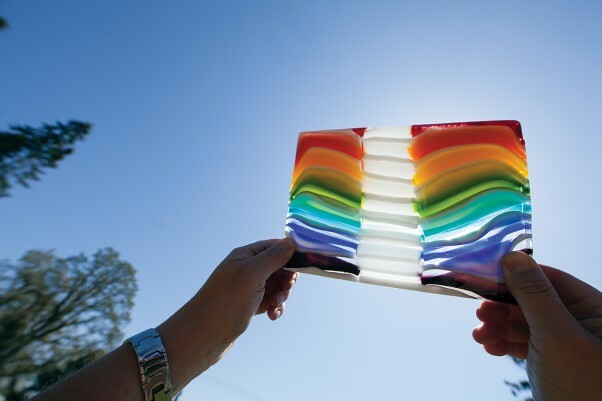 Arends lifts a piece of glass to the light, demonstrating how the color shifts depending on how you hold it, and also how you can see right through it. This is dichroic glass, a medium Arends has been working with for a long time. It is created when vaporized metallic oxides settle on sheets of glass in a chamber, and this thin layer of metal refracts light in such a way that multiple colors are reflected on the surface. The fun thing about it is that one can never predict the outcome of the process. The metals will settle in a way that cannot be controlled, which means that every sheet is different. While Arends orders most of her glass from Ontario, she has just received some from a friend in Las Vegas, and her eyes light up as she points out a few of the new styles—crinkled glass and patterns. Her excitement is contagious, and she wants to share her passion with others in the form of workshops. “Many people want to try something, but don’t want to invest long term,” says Arends of her decision to open her studio to others. “I have all the materials, the tools and the space, so people can just come try it.” Workshops start at $85 and go up, depending on the project, and are typically offered twice a month. “It’s a combination of doing something crafty, and just connecting,” says Arends, who posts the workshops online, but also hosts workshops upon request if a group of friends would like to gather for the evening. The cozy studio has a large table in the centre surrounded by chairs, and it’s easy to envision five people chatting happily as they work on their projects. The beginner’s art fusion glass—participants create an 8”x8” bowl—is her most basic class. Participants can expect to spend three hours in the studio, selecting, cutting and assembling their glasswork. Once they leave Arends begins the process of firing the glass in the kiln. Her large kiln can hold up to four of these glass bowls, which are fired at a very high temperature for 24 hours. “The glass pieces come out totally flat, like a beautiful tile,” she says. These tiles are then placed in a mold, and fired again for 12 hours. Once the pieces are complete, Arends takes them to her mini photography studio in the back, where she snaps a picture or two to post on Facebook. This way people can see when their art is ready for pick up, usually within a week or two of the workshop. Sometimes Arends has clients mixing mediums—such as when driftwood is combined with fused glass pieces in the wind chime workshop. Another class that combines these materials is the driftwood bird houses, which are decorated with fused glass. “I love offering classes,” says Arends, “and I try to come up with something inspiring.” Her latest workshops are posted on her website and on Facebook. Shortly after that she decided to stay at home, focus on her children and Fireworx also began to grow. Now with three daughters aged 9, 12 and 16, and a husband in the Air Force who has been away in Halifax for the year, Arends has had to balance her artwork with life’s daily demands. “I needed to be there for the kids first, and everything else later,” she says of her choice to put the house and her children first, and her work second. Yet over the years she has built a business out of passion and determination. “I worked in my winter jacket,” she says, explaining how the space often had not heated up until she was finished her work. The warmth of the sun and the open door is a welcome change. “I’m very happy to be in the Valley,” she says of her family’s move to Courtenay last summer from Moose Jaw. “I really want to stay here. It’s the third time I’ve been here, and I think three times is enough,” she adds with a smile. In the back of her studio, three acrylic paintings are set up. Arends has recently taken a painting class, and now finds herself drawn to creating artwork on canvas. “Acrylic is just a technique,” she says, explaining that she has been working with this medium in the hopes that she can transfer the skill to her glasswork. “Then something really neat can occur.